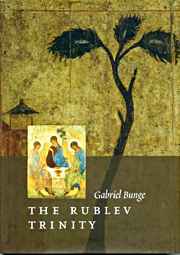 Many art historians and scholars have described the sublime icon of the Holy Trinity by St Andrei Rublev, but nothing equals this detailed and comprehensive theological explanation by Benedectine monk Gabriel Bunge. In this inspired and utterly sober work, Fr Gabriel aims to make the icon’s timeless message accessible to the contemporary praying believer. The author understands precisely that Russian iconographic art, much more than the Romanesque and Gothic sacred art of the West, represents a theological confession of faith. Icon painters were conscious of this responsibility, and the monk-painters who learned their Orthodox faith through the prayer of the Hours and the Divine Liturgy, through the familiar texts of the hymns and the Gospel readings, reflected the revelation of God in their art.